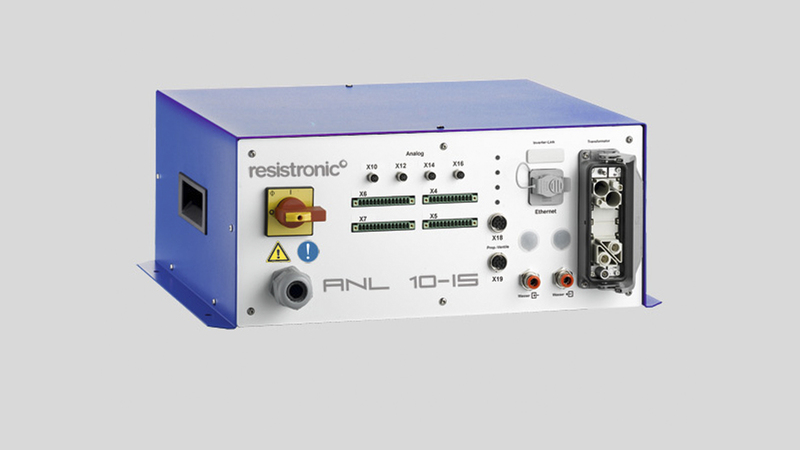 The multi-functional high-end inverter systems ANL 10-IS are used for micro-resistance welding. They are suitable for the production of reliable electrical and mechanical connections in controlled quality. Punctiform connections are predominantly produced, and connections of parts made of different metals are possible. An exemplary application is the electrical contacting of stamped parts with or without welding bends and of wires or flat contacts. Users are found in the automotive, battery, solar, electronics, medical, aerospace, cable, and other industries. Plant integration of ANL 10-IS is possible. ANL 10-IS consists of transformer, inverter welding current source and touch control panel for the integrated inverter welding control. For operation, Resistronic offers pneumatically driven welding heads and welding tongs. Furthermore, Resistronic offers the intelligence of the most advanced multifunctional welding control in multi-processor architecture. Special hardware and software requirements are implemented by Resistronic as a developer and manufacturer. Resistronic does not work with external process analyzers to monitor processes, since the welding controls include more process monitoring functions including storage 100. 000 welds each with 30 metadata and 8 curves without cycle time interference in the process. In the course of the trend or the history, the target welding programs that are stored for this purpose are also displayed for the metadata and curves; in the case of bad welds, any changes to the parameters are determined. The control system offers 4 free analogue channels for distance / force monitoring for four welding heads. Two channels for the incremental distance measurement allow the monitoring of up to six welding heads. All Resistronic controllers have a temperature control for applications in the area of hot bar, soldering, bonding, thermo-compression welding as well as current-voltage control.